The process of getting into and out of a clean room is elaborate, time-consuming and presumably prone to error. This could be circumvented by using VR-interfaced remote control androids, meaning that access would only be necessary if a repair were needed to the actual androids which could not be effected by others. Same applies to operating theatres. Go on, tell me it's baked in a similar form. PS: Sorry this is in "other:general" - i'll move it when i get the chance. no such thing as //remote controlled androids// capable of work at that level of detail. By remarkable coincidence, I have just come out of our cleanroom. However, it is probably not what most people call a cleanroom - we use it for microfluidics (basically the same processes as for semiconductors), and the set-up is very simple but effective. That said, cleanliness is much more important for making large and complex chips, and changing in and out is indeed a tedious business. I am pretty sure, though, that serious chip manufacturers have already automated as much as possible of the process, both for cleanliness and for efficiency/consistency. //cleanliness is much more important for making large and complex chips// It's true. When making the superior Mandelbrot chip, which is infinitely more flavourful than the traditional oblong variety, fresh oil and a clean cooking vessel are essential. Week old lard tends to clog the convolutions and stick to the teeth. It's just a matter of fracticality. Whereas i'm sure there aren't, if there were the idea would be other than halfbaked. meh. the least you could do is make them animatronic rabbits. //By remarkable coincidence, I have just come out of our cleanroom// - doesn't Maxwell Towers have a clean wing? All the wings are clean, thanks mainly to the continued efforts of Mrs Clepsydra and her staff. However, I was referring to the Buchanan Laboratory which, for reasons of safety, is located well away from the main house. Today is clearly a day of coincidences. 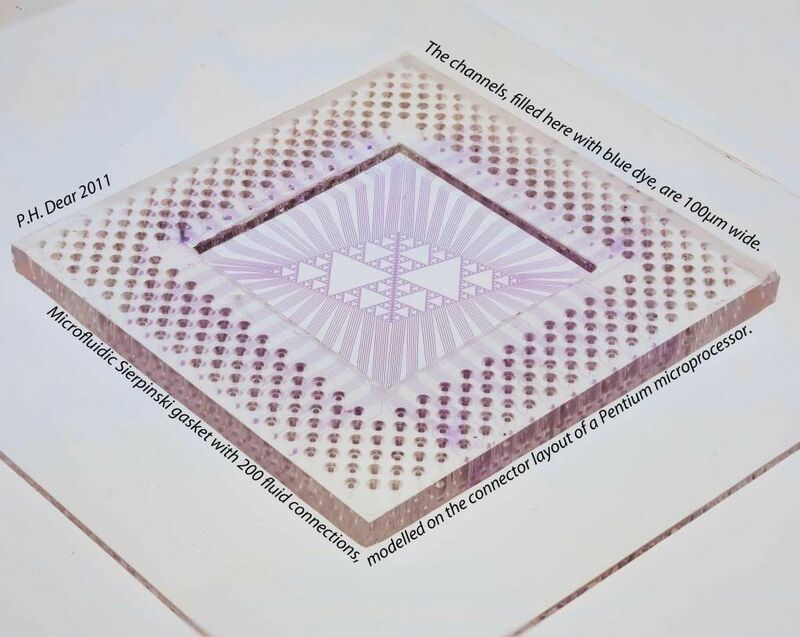 I am the proud fabricator of the world's first and only Sierpinski gasket microfluidic chip (link). Utterly useless but it was fun.